Yes, I love making cakes and decorating them. No, I don’t particularly like the consistency or taste of most cakes. I used to eat a lot of cake regardless of not being particularly fussed by it, but when I decided to just stop eating things because they were there, I pretty much completely cut cake out of my diet. The thought of only two cakes makes my mouth water. One, is the carrot cake that I had at Chiquita Cafe in Willoughby last year when I was on holidays with my dad and the second, is my nanna’s yellow sponge with cream and strawberries. Nan’s yellow sponge gets its colour from custard powder — preferably Homebrand. As a kid, she would serve this triple decker cake for afternoon tea and it was light, fluffy and sweet. My mouth is watering right now. I tried once to replicate the yellow sponge but making cake in a house with my dad and my dog made wasn’t a good idea (Dad slammed doors and chased the dog around the house) and the cake flopped in the middle. That experience, years ago, had scared me off attempting the sponge again. But a few months ago, a friend at work had a birthday and I wanted to make her a chocolate cake. Not a cake with icing or ganache, but something light and fluffy with lashings of sweet whipped cream and big, fresh berries. All I could think about was how well sponge cake goes with cream, so, I attempted making a “proper” sponge cake once more. I came across this Donna Hay chocolate sponge recipe online and decided to try it out. I live alone now, in a mostly very quiet apartment complex without a father or a dog to cause the cake to flop, but every slammed door on my floor or the one above me caused me to run to the kitchen to check the cake. My oven doesn’t have a light, so knowing the dangers of opening an oven mid-cake cooking, I spent a lot of time sitting on the kitchen floor shining a torch into the oven. It took a lot longer to cook than the recipe suggested, but I didn’t split my mix between to cake pans, I cooked it all in one. Once it was out of the oven, there were a few nervous moments before I slid it out of the pan and then finally, a sigh of relief; it cooled perfectly flat without sinking at all. I don’t know if it was the quieter living space or just that my baking skills are a million times better than they were the first time I tried a sponge, but the cake turned out really well and everyone enjoyed it. 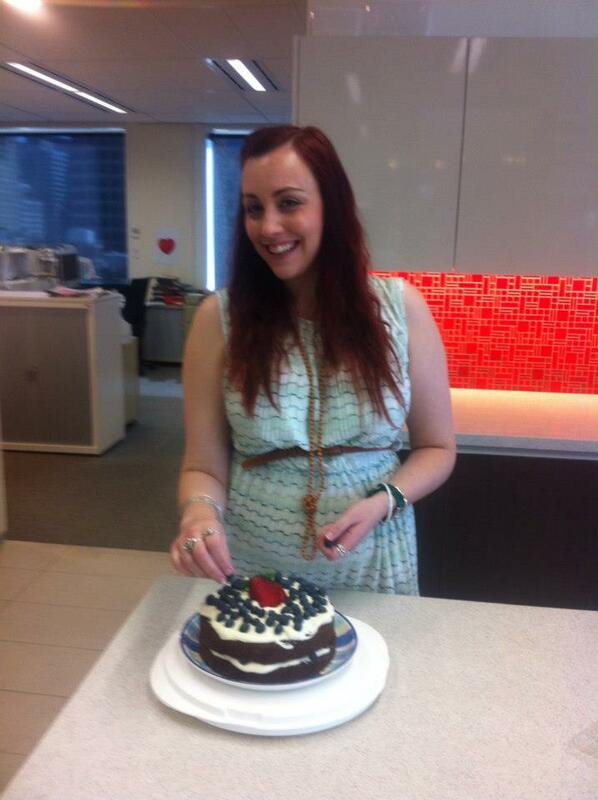 I was so pleased with the results that a week later, for my boss’s farewell, I baked second chocolate sponge. This time, I tinted the cream Tiffany Blue (my lovely boss loves the colour) and flavoured it just slightly with rosewater. In the background there’s also a vanilla butter cake (not a sponge) with the same cream and berries treatment. It won’t be long, I think, before I attempt the beautiful yellow sponge once more.